Composed by Jacques Leguerney. 20th Century, Christian, Sacred, Repertoire, Recital. Score. 15 pages. Published by Musik Fabrik (S0.322301). This is one of two duets that Leguerney wrote for Geneviève Touraine and her brother, the famous French baritone Gérard Souzay. It was completed on 21 January 1950. The first performance, with Souzay and Touraine, was 21 June 1950 in the Parisian Salle Gaveau with Jacqueline Robin (Bonneau) at the piano. 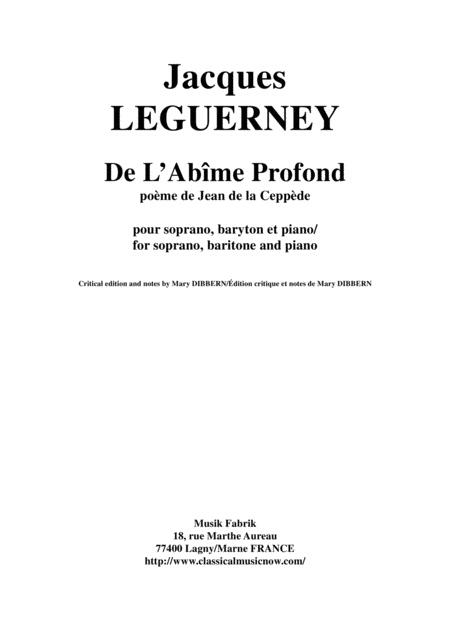 Previously unpublished, De l’abîme profond, was first recorded by soprano Danielle Borst and baritone Philippe Huttenlocher with Mary Dibbern at the piano. This was for the CD 50-9618, 28 Mélodies issued by Claves Records-Radio Suisse Romande: Espace 2 in 1996. The recording was recognized with the Grand Prix du Disque de l’Académie Charles Cros. The US premiere performance was by soprano Jill Pearon and baritone David Pittman-Jennings, accompanied by Mary Dibbern, during a recital at the Crane School of Music, SUNY-Potsdam, New York, 23 October 2007. The vocal range for the soprano line is C1-G#2 and for the baritone line is B-F1. The text’s poet, Jean de La Céppède (1550-1622), was born in Marseille and spent most of his life working as a lawyer and magistrate in Aix–en–Provence. His principal work, Théorèmes, consists of 515 sonnets dealing with the life of Jesus Christ and the “sacred mysteries of our redemption.” La Céppède’s poem is a translation of a psalm by David from the Old Testament of the Bible. 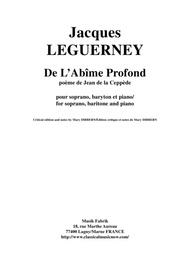 Leguerney also set a psalm of David for medium voice and chamber orchestra, which was premiered by Gérard Souzay in 1954. This orchestral Psaume LXII de David is also published by Musik Fabrik. For a detailed discussion of the music and both a word-by-word English translation and International Phonetic Alphabet transcription of the French text, see The Songs of Jacques Leguerney: A Guide for Study and Performance by Mary Dibbern, Carol Kimball and Patrick Choukroun. Series VOX MUSICAE: The Voice, Vocal Pedagogy, and Song. General Editor : Kathleen L. Wilson. New York: Pendragon Press, 2001.